Cherry Pie is one proud mom after his son, Antonio Tria, earned high honors at his high school for being a successful student athlete. The actress also relayed that her son is now working on his world tennis ranking. “Tennis player siya in the Philippine team but now we are working on his world ranking sa tennis so nagto-tour na siya so I am so proud. Sa Ateneo that was such an accomplishment because even with his training and being a student athlete, he graduated with one of the highest awards for sports. [Then] second honors sa academics. Blessing ‘yun. 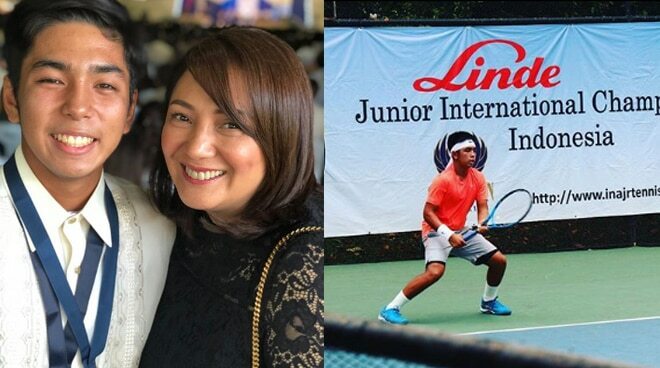 And then because of his tennis we also transferred him from Ateneo and now he is in Colegio de San Agustin which supports ‘yung pagiging athlete niya,” she said. Cherry Pie confessed that she has been feeling emotional now that his son has been going on tour. “Now nag-aadjust din ako bilang nanay at nagkakaroon din ako ng separation anxiety kasi nga because of his tours and hindi ako nakakasama because of work. World ranking inaasikaso namin ngayon so nawawala siya ng isang buwan, dalawa o tatlong linggo so ang hirap di ba? So sabi ko sa kanya intindihin niya ako because for 16 years of my life ang mundo ko umikot sa’yo. So I am making adjustments but I am very thankful because things are doing well,” she stated. According to Cherry Pie, his son will begin applying for sports scholarships abroad next year. “Now he is in senior high school by next year there will be iyon na ‘yung recruitment time from colleges abroad that’s why we are building up his world ranking. Actually ‘yan na ‘yung basis eh ‘yung International Tennis Federation Juniors ranking. Ngayon he is top 800 around the world so hopefully before the end of the year mapapataas pa namin. Tapos ngayon so matatapos na ang Blood Sisters masasamahan ko siya, we will be competing in Africa for two leagues, so hopefully we will have good results,” he stated.